There were so many updates on ClixSense ever since I last posted my experience with it. The first thing na I was concerned of, which I also included in my previous post, is the removal of PayPal as one of their payment method. But they added Payoneer instead. However, Payoneer's minimum cash out is $20 and the fee costs $2 fixed. So ever since PayPal has been removed, I haven't cashed out yet in the hope that PayPal will be returned in the options in the future. As for this month of July, a huge change on ClixSense occurred. Uunahin ko na ang bad news. "With the negatives out weighing the positives, and after 10 years in the PTC business, we have decided to move forward without PTC. Beginning July 15th, 2017 PTC ads will be removed from ClixSense. Along with the removal of PTC we have also decided to remove ClixGrid and the premium upgrades, including the corresponding 8-level commission structure. As of today, July 1st we will stop selling upgrades, PTC advertising and ClixGrid. Those of you who have ad credits on your account may still use them until July 15th. Any member who has purchased an upgrade in the last 24 hours will be immediately refunded today. We are stopping the sales so any remaining ad credits or ClixGrid campaigns can expire." So ClixSense members are to expect the removal of the PTC ads and ClixGrid on July 15. There's also the removal of the 8-tier affiliate program, which I am not really familiar with because I have not used that program, as well as the removal of the premium upgrade which I have not used as well. And the minimum cash out of $8 for standard members before was increased to $10 (This will apply to all members since there will be no standard and premium beginning July 15). • Checklist bonus will now pay a maximum of 10% if all requirements met." At first, I was worried because I do most of the clicking of PTC ads. But few days after the announcement, I noticed the increase in surveys available as well as the tasks. 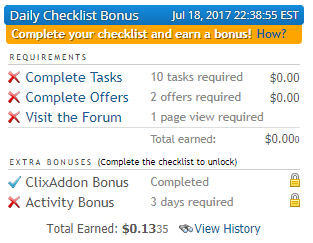 For the second time ever since I started ClixSense, I was able to complete the Checklist bonus. The decrease on the available PTC ads prior to the implementation of the change in ClixSense's business model is also noticeable. But since I have already shared to you on my previous post that I mostly earn by completing surveys rather than by clicking PTC ads, I think this new business model will be for the better especially if the surveys and tasks available for the members will increase. As of this writing, July 19, PTC ads and ClixGrid has been completely removed and ClixSense has already moved to their new site layout which started on July 17. They are still working on the new site, fixing bugs, refunding upgrades, etc. "Members, as of today the minimum cashout required for Payoneer has been lowered from $20.00 to $10.00. Please note, the minimum balance needed to transfer funds from your Payoneer account to your bank account has not changed. That is additional good news aside from the noticeable increase in surveys and tasks available (my location is in Philippines by the way). I will still observe if this change will have a positive impact on the long run. As for me, I will still hold my earnings in my account and will still wait for a few months if they will be able to get back the PayPal option. I am optimistic about this due to the change in their business model. I am hoping that their new business model will meet the requirements and new policies of PayPal. I do hope too that everything will work for the better. My E-book Had Its First Sale~!